Hope you're doing well! I've had such a crazy week and have about 5 different posts all lined up to be posted but just hadn't had the time to get them live. Sorry! I let Bicky decide what she'd like to do on here and she chose to recreate on my EOTDs which I was quite chuffed about, I have to admit. Give here a warm welcome and leave her lots of comments!!! Without further ado... I give you.... BICKY! Hi 6 Inch Stilletos followers! 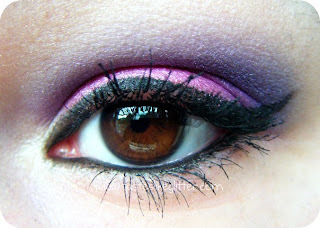 I'm here guest blogging a recreation of one of Amrita's lovely past EOTD's. 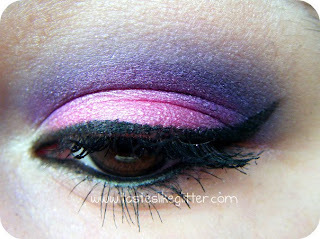 The EOTD I have chosen is a purple and pink combo from May. The reason I chose this was because I've never really used pink in an eye look. If you don't get it spot on, it can look like you're just really tired and your eyes are irritated. 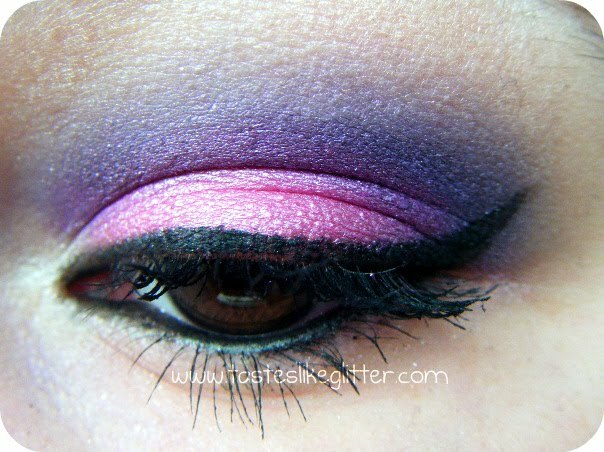 But teaming it with purple, really gets it away from looking like that. The pink shadow is a random one from my 88 Shimmer Palette (all over lid). M.A.C Blackground Paint Pot (crease, outer V). M.A.C Eyeshadow - Parfait Amour (crease, outer V). M.A.C Fluidline - Blackline (upper lashline). In the meantime, if you want to see more EOTD's and reviews you can check out my blog or you can come and chat to me on Twitter. I love both versions: amrita and yours. Wow thats stunning! 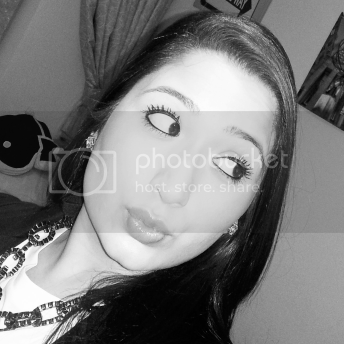 I cant wait to be able to wear make up again! @Liloo I think I must have lash anorexia coz they don't seem at all long to me! :/ That's advertising for you though. this is such an awesome idea (: unfortunately not many follow my blog so it'll be a shame to have guest bloggers on mine! awesome creation and recreation of this loo and great post!